Lewis Hamilton won the Chinese Grand Prix to take the lead of the Formula 1 drivers' championship for the first time in 2019, leading Mercedes' third-straight one-two finish of the season from Valtteri Bottas. The Silver Arrows were utterly dominant in Shanghai as Ferrari's pre-race hopes of impressing fell apart amid a farcical application of team orders. 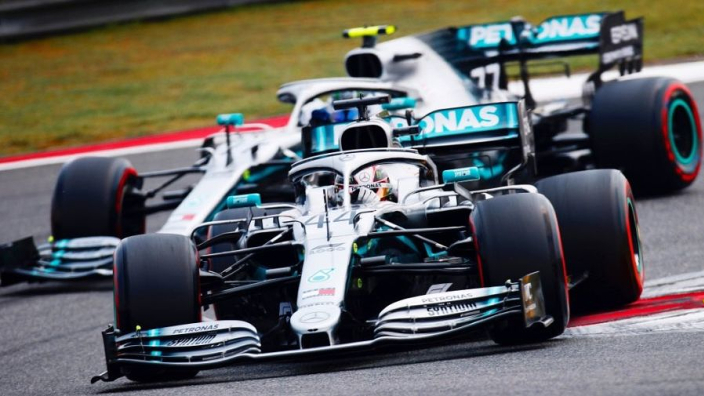 The 1000th World Championship race was not the thriller that Liberty Media and F1 fans might have hoped for as Mercedes bolted clear at the start – Hamilton pulling a crucial move on pole-sitter Bottas. Sebastian Vettel followed the Silver Arrows onto the podium, having come out as the winner from a ludicrous sequence of events on the Ferrari pit wall. Leclerc jumped Vettel off the line for third place, but was told to let his team-mate through as Mercedes streaked away. However, Vettel's pace was no more impressive once allowed through, leaving Leclerc audibly furious as Ferrari dithered over a decision whether to swap them back. In the end, Leclerc was left out far too long amid the pit-stops and dropped to fifth behind Red Bull's Max Verstappen. Having been quite clearly sacrificed in favour of his team-mate, Leclerc perhaps got his first real taste of the "priority" afforded to Vettel in 2019, although Ferrari's early-season struggles see them already trailing Mercedes by 57 points after just three races. Behind Leclerc, Pierre Gasly finished sixth for Red Bull and took the fastest lap late on, his best result of the season so far, although he was still way off Verstappen's pace. Daniel Ricciardo saw the chequered flag for the first time in 2019 in seventh, with Sergio Perez and Kimi Raikkonen climbing into the points, as well as Alexander Albon, who drove the Toro Rosso brilliantly to 10th after starting in the pit-lane following a huge crash in Saturday practice.